DES MOINES, Feb. 10. – Frank Coleman won from Charles Hackenschmidt here to-night in a wrestling match, mixed style. Coleman won the first fall, catch-as-catch-can, in 16 minutes and 5 seconds; Hackenschmidt took the second Graeco-Roman in 26 minutes 33 seconds; Coleman the third, catch-as-catch-can, in 20 minutes 20 seconds. The move launched several days ago by Charles Hackenschmidt, the famous wrestler now residing in Santa Clara, to establish a wrestling school in this city, is meeting with splendid success. The wrestler stated yesterday that he is confident that he can secure the Santa Clara club hall on Alviso street for his headquarters and that the opening event will be held some time between April 10 and 15. George Bothner will be at Princeton three times a week until April 1, to coach the university wrestling team. 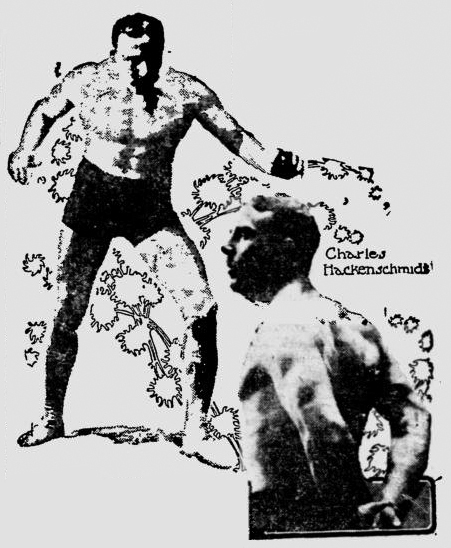 Charles Hackenschmidt, cousin of the Russian Lion, is on a wrestling tour of America. Famous San Antonio Grappler Defeats Abps in Six Minutes and Thirty Seconds – Mihovil Springs Sensation. Hackenschmidt Won Two Falls From Carl Pons. Frank Gotch of Humboldt Secured Two Falls From Hackenschmidt. The Big Swede Was Game to the Last, but Was Outclassed by Gotch – Great Crowd Saw Contest and Cheered Lustily. Des Moines, Ia. : Charles Hackenschmidt, a Russian wrestler, defeated Farmer Burns in a mixed match. Hackenschmidt won the first fall at Graeco-Roman in 18 minutes, and Burns the second at catch-as-catch-can in 19 minutes and 30 seconds. Hackenschmidt chose for the third fall Graeco-Roman, and won in 15 minutes.